The chocolate cupcake has Kahlua in it and the marbled fluff you see is a Biscoff frosting marbled with chocolate ganache. It may sound like an odd coupling, but it’s really such an awesome combination. The pretzels give the whole ensemble a saltiness that balances the rich chocolate ganache frosting and also provides a nice crunch to the softness of the cupcake crumb. 10. Stuffed with a mini peanut butter cup and topped with creamy peanut butter frosting, these cupcakes make a dream dessert for peanut butter lovers. 13. 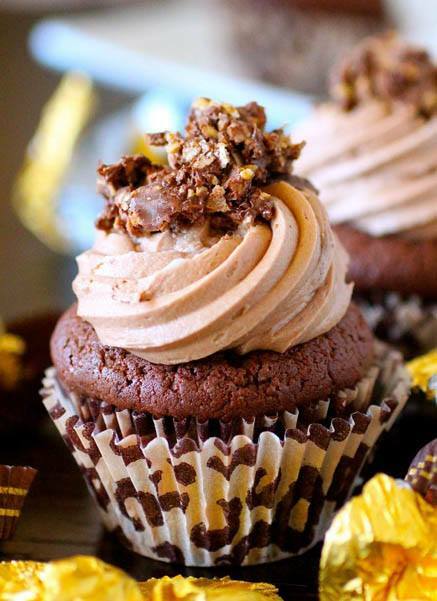 Delicious chocolate cupcake filled with awesome Ferrero Rocher candies and frosted with Nutella buttercream…super tasty! Melted chips and a cookie cutter are all you need to create the wow for simply delicious cupcakes. This scrumptious cupcakes oozing chocolaty goodness will satisfy even the pickiest chocolate lover. I can’t wait to try these! I can feel the added pounds already! Yum!